Photographer Bill Rose walks us through Recapturist, a website dedicated to preserving the history of head-turning American signage. On his website Recapturist, Bill Rose documents signage across the United States. 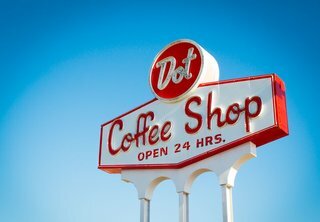 Along with the photographs, he details the history behind the subjects, like the Houston, Texas, coffee shop Dot. "In addition to being a Houston landmark since 1967, Dot Coffee Shop and has the distinction of being the first offering by wildly successful restaurateurs the Pappas Brothers," he writes. 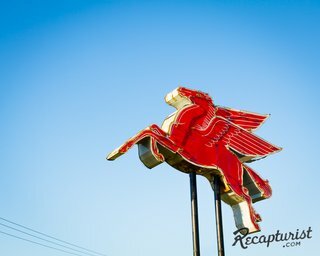 Recapturist is the intersection of several things I’m passionate about: photography, road trips, vintage neon signs, and the "micro-history" of America. 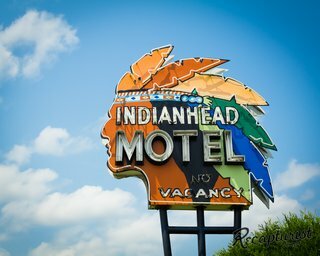 One of Rose's favorite signs belongs to the Indianhead Motel in Chippewa Falls, Wisconsin. "The colorful headdress on this one—repainted as recently as 2008—is even more stunning in person," he says. "Thanks to help from the local historical society, I was able to trace its origins back to 1958 when a man named Ernest Cote first opened the motel." Every year I log thousands of miles exploring this country’s back roads on a search for vintage neon. The goal is to document not only the image of the sign, but also any interesting facts I can uncover about the business it advertises, its owners, or the sign itself—historical accounts of small businesses that might otherwise never be recorded. 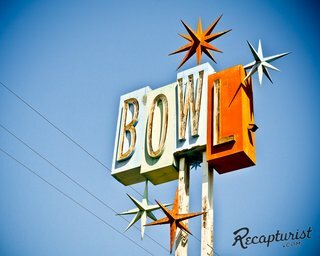 "This one is a product of legendary sign designer Wayne Heath, and it’s all that remains of the old bowling alley it stood for," says Rose of this shot of the Premiere Lanes in Santa Fe Springs, California. "I had to overcome a chain link fence and chest-high brush to get this shot but it was definitely worth it—just look at those Sputniks!" The result is a gallery of fine art photographs accompanied by these stories and displayed on my website for the world to see. The money generated through the sales of prints and other merchandise helps fund future trips, enabling me to document even more signs. "This huge Pegasus can’t be missed as you drive past the service station it soars in front of," Rose says. "I tracked down the previous business owner and learned that his father had bought it from a shuttered Montana Exxon station in 1982 and that it most likely dates back to the '30s." How did you first become interested in vintage signs? 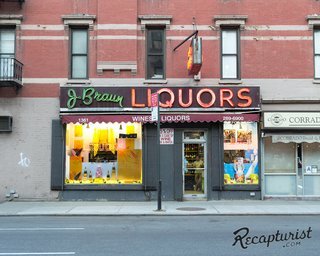 In addition to signs, Rose documents storefronts, like J. Braun Liquors in New York City. "Julius Braun was a Jewish immigrant who arrived in the United States from Poland with his family in 1921," he writes. "He was only seven years old at the time. City records indicate that the neon signage was installed in 1952. When Mr. Braun passed away in 1995, the store was sold to new owners who, despite changing the business name to ‘Uptown Wine Shop’, never updated the signage out front. No complaints here." The seed was planted back in 2006. I was living in Seattle and had just purchased my first real camera. Around that same time I started to notice all the old motel signs that dotted a notoriously sketchy strip of Aurora Avenue known as "The Blade." So one Saturday, I took my camera and canvased the area on foot shooting every sign I came across. I was captivated by the personality that radiated through their once proud but long since neglected exteriors. I was immediately hooked and have been doing it ever since. 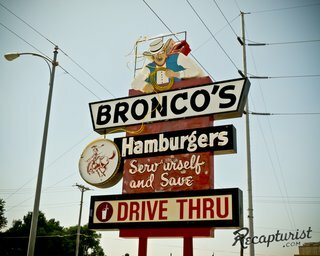 The signs hail from all corners of the United States, like Bronco's Restaurant in Omaha, Nebraska. Can you tell us a bit about the various road trips you’ve taken recently? How do you plan where to go? 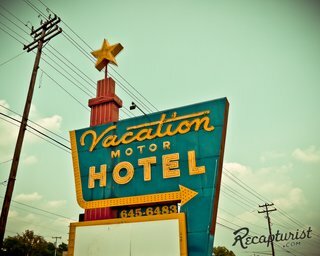 The Vacation Motor Hotel in Clarksville, Tennessee. The road trips my wife and I take can vary in length from a single afternoon to several weeks. One that really stands out is the trip we took from our home base in Minneapolis to the Florida Keys a couple of summers ago. We had always wanted to drive the Overseas Highway that connects the Keys with the mainland, and that seemed liked as good a reason as any to head out and finally do it. We logged over 4,500 miles in 13 days despite spending three nights relaxing on the beach in Key West. I’d guess fewer than 500 of those miles were spent on an actual Interstate. We took back roads almost the entire way. 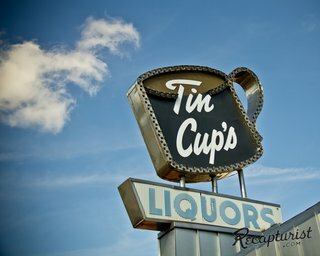 Tin Cup's in St. Paul, Minnesota. The very next summer we did something similar, but that time Delaware was our destination. The reason? My family used to vacation at Rehoboth Beach when I was little and I was feeling nostalgic for the boardwalk. The journey is such an enjoyable part of our trip that we usually have little trouble justifying whatever direction we feel like heading. Some people think we’re crazy, but we love being in the car together and interacting with the parts of this country that we’d drive right past on the Interstate. It always feels like an adventure. Have you ever driven Route 66? I haven’t, but for good reason. It’s not that I have no interest in doing so (I do); it’s because that stretch of road is already so well documented—you can find hundreds of photos of every single sign along Route 66 with a simple search. The biggest thrill for me is finding a sign that I’ve never seen a picture of—a sign that might soon disappear from the roadside without any evidence it ever existed if not for me. That feeling just doesn’t exist on Route 66, so I tend to prioritize less beaten paths. Can you recommend a couple of really good routes for people who might be interested in planning a road trip to see some of these signs? If you’re anywhere near the Bay Area, I highly recommend El Camino Real (State Route 82) between San Francisco and San Jose. I saw so many signs along that 40-mile stretch that a full day wasn’t enough time to capture them all. It was incredible. But regardless of where you are in the US, the best advice I can give is to find the roads that served as the main highways and thoroughfares before the Interstate system arrived. That is where the best vintage neon tends to be. Is there a specific part of the country that has a lot of vintage signs in good condition? Los Angeles was the epicenter of the Googie movement that inspired many of the most interesting signs, so generally speaking, the closer you are to Southern California the more elaborate vintage neon you’re going to see. Unfortunately, the condition of the signs can vary greatly since most are at the mercy of a small business owner who may not value it enough to shoulder the costs required for proper maintenance. Otherwise, some of the best areas I’ve come across include Las Vegas (not the Strip, closer to Fremont Street); Wildwood, New Jersey; and St. Petersburg, Florida. And then there are places you wouldn’t necessarily suspect, like Sioux Falls, Omaha, or right here in Minneapolis that also have an impressive collection of neon signs still in service along the roadside. What about the 1950s and 1960s makes it "the sweet spot" for signage? There was an interesting domino effect that led to it all. Follow me here…It started with the post-war economic boom of the 1950s that enabled many Americans to own a car for the first time. This influx of newly mobile customers led to the birth of new automobile-related industries like drive-through restaurants, drive-in movie theaters and motor lodges. These small business owners, now in heavy competition for customer’s expendable income, often commissioned head-turning signs made from a relatively new technology called neon. As the 1960s rolled around, the Space Race was in full swing and our fascination with outer space heavily influenced the designs of the time. Suddenly, satellites and rocket ships were en vogue, and the result was some of the most striking signage that has ever been produced. Why do you think it's important to think about preserving signage? These signs are an endangered species; a unique part of the American landscape that’s disappearing at an alarming rate. Just about every photo on my site was taken within the past five years and already several of them are no longer in existence. Most have been replaced by a new plastic monstrosity, usually devoid of any character whatsoever. The personality of our roadsides is eroding away and the gap between the golden age of architectural design and the present day continues to widen. I realize not every sign can be saved, but hopefully they can all be documented for future generations to appreciate before they are torn down. That’s where I come in. Do you have any book recommendations for those looking to learn more about vintage signs? Anyone interested in signage should check out a book called Store Front - The Disappearing Face of New York by James and Karla Murray. They did a masterful job recognizing the underappreciated aesthetics of their subjects, and they had the foresight and skill necessary to perfectly preserve these facades so they could be witnessed well after they’re gone. That is exactly what I set out to do with my own work. If you’re interested in neon specifically, there’s a book called Vintage Neon by Len Davidson (a neon designer himself) that’s packed with hundreds of photos and interesting information about the history of the craft. 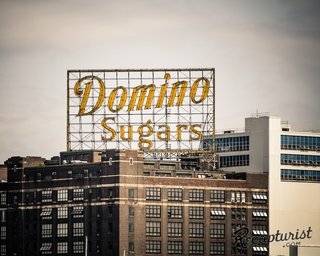 What can people do to help preserve vintage signage? 1) The Society for Commercial Archeology (SCA) is devoted to the study and preservation of American roadside architecture. Membership is inexpensive and connects you with hundreds of like-minded preservationists from across the country. 2) The American Sign Museum is a must see if you are anywhere near Cincinnati. The museum features rescued & restored signs, mostly neon – but some as old as the sign industry itself – and is something you simply have to see to believe. Reasonable memberships are offered and donations are accepted if you can’t support them with a visit. And if you’re ever in Las Vegas, don’t miss the boneyard at the Neon Museum.